For the Christmas 2005 Activity, players have to help out around the pixie workshop to get several rewards. 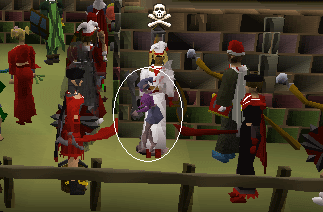 Cool Imps that are dressed up as santa or elves and you can rob them. 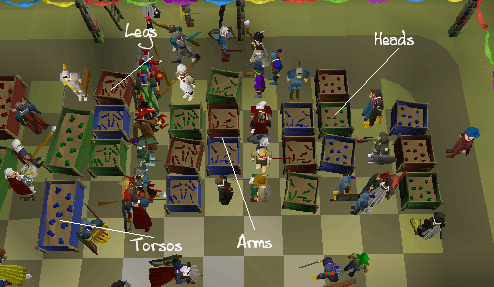 First head to Diango in Draynor Village. He is the toy salesman. 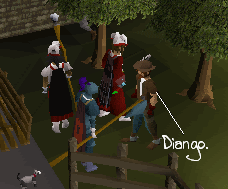 Here is a map of Diango's location and the workshop. The house is next to the (!) on the map. Once inside it may be crowded because of the amount of people doing this kind of mini-quest. The Head Pixie Rosie will be the nearest NPC as you enter the workshop. 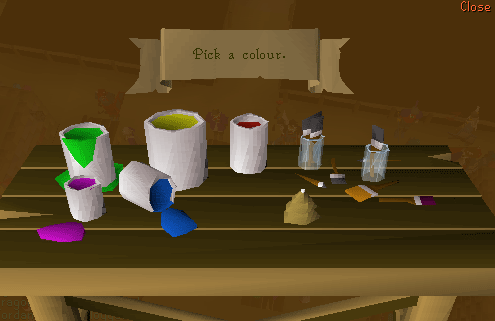 Click 'I need a box for painted Baubles' And you will get an empty present box. Now head to the far east of the room and you will se many crate. Make sure you have an empty inventory apart from your empty boxes. Now fill the inventory full of Baubles from the crates. Once your inventory is full head to the far west. Now Its time to paint in the painting area! Now left click a workbench with paints on and paint. I found painting in order easier I used Pink--Blue--Green--Yellow--Red. Now, head to varrock center where the fountain usually is and you will see a giant tree. 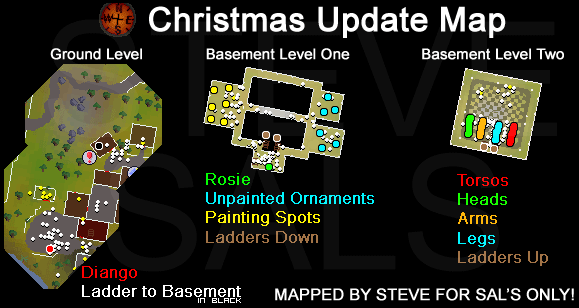 Use the remaining 5 Bauble filled boxes with the tree and a cut scene will occur. Watch it and when its finished left click at the bottom of the tree and you will receive a Puppet! Now head back to Rosie in the workshop and instead of asking for a box of painted Baulines ask for a box for Marionettes (puppets) and go downstairs. Ok, The reason I labeled each crate is because instead of painting, you make the puppets. But, You make them in this order: Torso--Head--Arms--Legs--String. With the new box that was giving to you by Rosie, make 2 of each colored puppet (2 Green, 2 Red, 2 Blue) And put all 6 puppets in the box. Repeat this till you have 8 filled boxes. 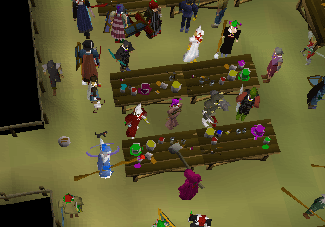 Now it's off to Falador. 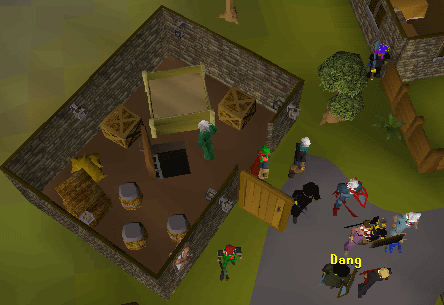 Once in Falador had north to Doric's House which is in Doric's Quest and just 5 steps west there is a mysterious man. 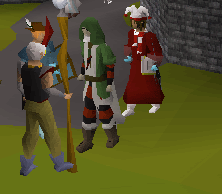 Which to some is Saradomin, Guthix and Santa. 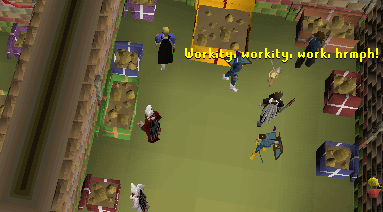 Talk to him with the 8 puppet filled boxes and he will tell you to speak to Diango. 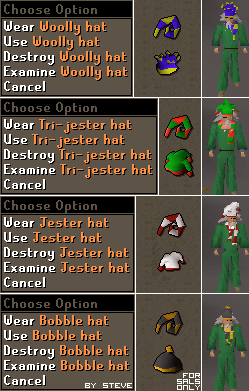 So head back to Draynor Village and speak to Diango to receive 4 Hats. If you don't like the color of yours, you can get a new one from there. You can only have one marionette at a time, so just destroy your current one to get a new one. The three colors are red, blue, and green. Congratulations! You've Completed 2005 Christmas Holiday Event!